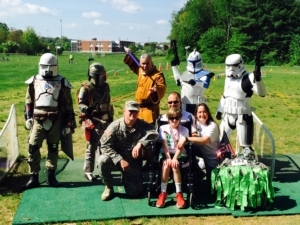 What started as a team name for an MDA Muscle walk in 2013, the 4 Jake’s Sake Foundation has become a 501(c)(3) charitable foundation whose main purpose is to help families living with Duchenne make their lives more accessible. Duchenne muscular dystrophy (DMD) is a genetic disorder characterized by progressive muscle degeneration and weakness. It is one of nine types of muscular dystrophy. DMD is caused by an absence of dystrophin, a protein that helps keep muscle cells intact. Symptom onset is in early childhood, usually between ages 3 and 5. The disease primarily affects boys, but in rare cases it can affect girls. Muscle weakness can begin as early as age 3, first affecting the muscles of the hips, pelvic area, thighs and shoulders, and later the skeletal (voluntary) muscles in the arms, legs and trunk. The calves often are enlarged. By the early teens, the heart and respiratory muscles also are affected. Attend our annual Millennium 5K Run and Walk on Sunday, May 19, 2019 at the Elks Club in Hudson, MA. The 4 Jake’s Sake Foundation helps children suffering from Duchenne’s Muscular Dystrophy and their families. If you are interested in contributing to our cause, please visit our Donation page.